Betrue Sporting Goods insists on the use of high-quality materials and advanced technology to manufacture oem sportswear. Besides, we strictly monitor and control the quality and cost in each production process. All this guarantees the product to have high quality and favorable price.Our company introduces foreign high-quality silk, cotton and linen and other natural fabrics for design and production of oem sportswear. At the same time, we also pay attention to the use of the latest high-tech fabrics. In this way, our garments have the comfort of natural fabrics and the superiority of high-tech fabrics for easy cleaning. Besides, they can be preserved for a long time.Compared with other products in the same category, oem sportswear produced by Betrue Sporting Goods has the following advantages. Betrue Sporting Goods has a number of high-quality R&D personnel and experienced technical personnel. This provides a strong guarantee for the quality of products. Betrue Sporting Goods focuses on interacting with customers to know well their needs and provides them with efficient pre-sales and after-sales services. 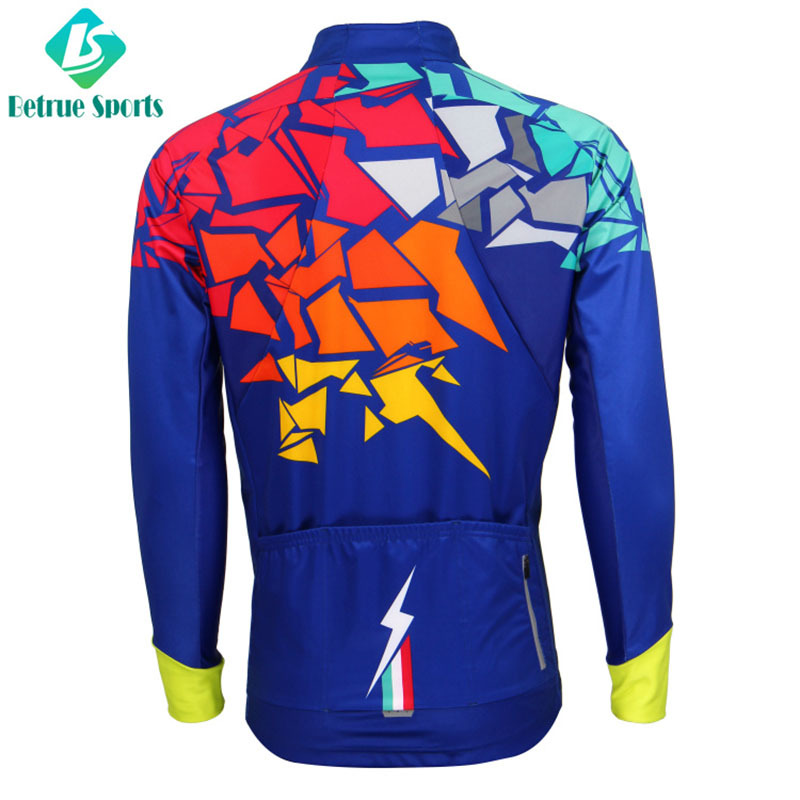 With the vision to become a Manufacturing Apparel Sportswear company with the most core competitiveness in China, Betrue Sporting Goods has always been adhering to the development philosophy of 'honesty and credit, professionalism, concentration, and sci-tech innovation', and the core values of 'unity, cooperation, mutual benefit and win-win'. We try hard to complete the corporate mission of 'winning customers with quality and connecting the world with technology'. During the development for years, Betrue Sporting Goods has been closely following the trend of the times and manufacturing oem sportswear based on superb technology. The products have been highly praised by customers for the high quality and unique style. Betrue Sporting Goods's custom cycling jersey are unanimously recognized by customers. The sales range gradually expands to all parts of the country. (1) Using the Italian MITI fleece fabric ( 84% polyester +16% spandex, 260g ). (3)High collar, Simple and comfortable template with the unique sleeve panel design is fit for training everyday in winter. High collar, Simple and comfortable template with the unique sleeve panel design is fit for training everyday in winter. Full concealed zipper way and Japanese YKK zipper. Triple pockets plus extra waterproof pocket. 1. Guangzhou Betrue Sporting Goods Co.,Ltd. is a leading global manufacturer and marketer of premium branded cycling jackets. 2. Through the biker jacket women technology, biker jacket men is produced to be of high quality. 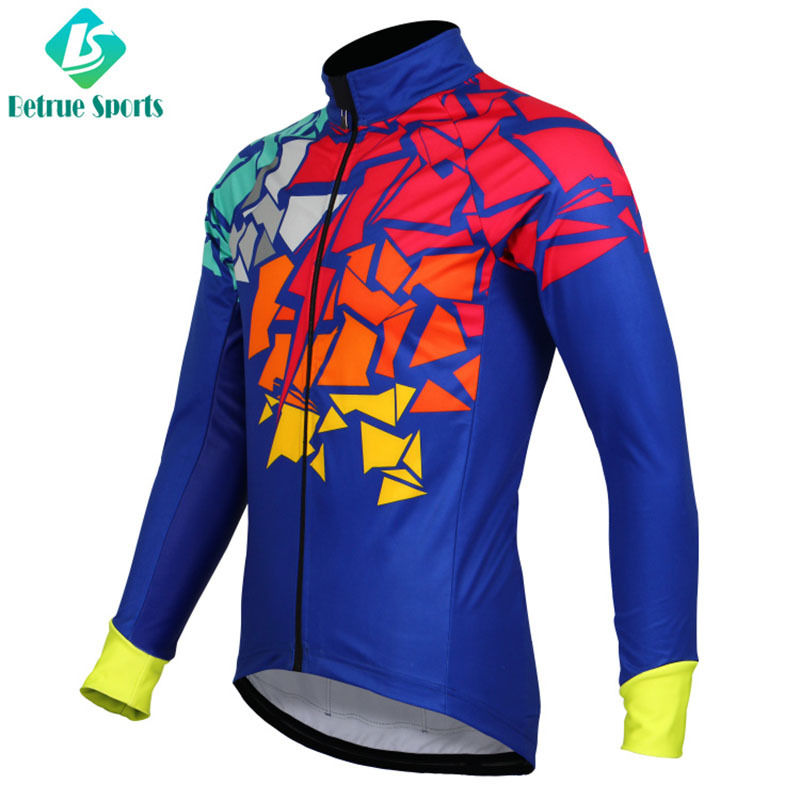 3. mens waterproof cycling jacket is the commitment of Betrue to customers. Ask!